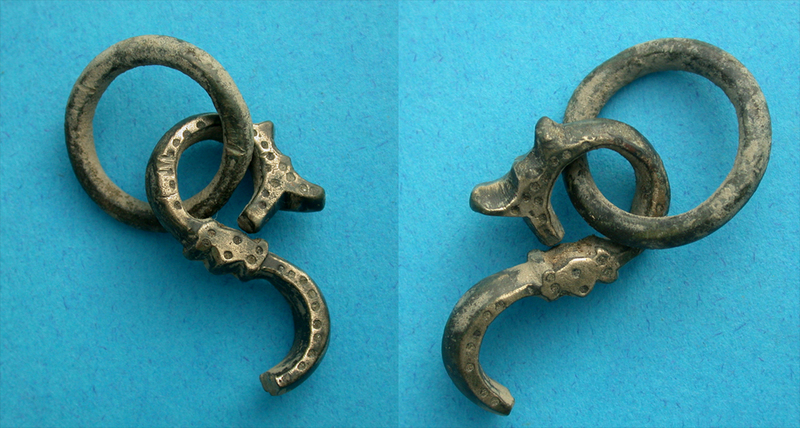 Buckle, Dragonesque, Ostrogoths, 5th-6th Cent, Rare! Ref/ Aleksander Staney, Elementi na germanskija fibule kostjum na jug ot dunav (Elements of Germanic Fibulae and Costume from South of the Danube), page 229-236. "These are part of a form of belt buckle. They are not a dragon, but an S. Very few have the dots and most are actually round in cross-section. 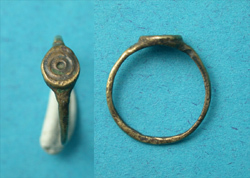 They link to plain round rings (as here), or buckle plates, either D-shaped or square with perforated decorations and a loop on one side. The are found in northern Serbia, northern Bulgaria, eastern Romania and the Crimea. They are generally dated to the second half of the 5th century (but were used into the 6th) and are associated with the Ostrogoths who migrated into the lower Danube at that time from the Crimea region." Seller's Note/ Thanks to Shawn C on the Forum discussion board for the excellent information above! S or not, it looks a bit like a dragon, doesn't it? An awesome couriosity that would make a killer pendent. After purchase, let us know if you'd like it completely cleaned and we'll be happy to do so at no extra charge.